Beach Lane Books, 9781481446693, 56pp. Even as a child, Zaha Hadid was fascinated by the landscapes and ruins of her native Iraq, seeing patterns in them she later repeated in her urban designs. Her unusual ideas prompted her to study architecture in London and eventually open Studio 9, an office in which she and her colleagues designed unconventional buildings that epitomized her mantra, “The world is not a rectangle.” Despite criticism and setbacks, Hadid’s belief in the impossible led to commissions to design a museum, an opera house, a stadium, and even a ski jump, which incorporated their surrounding landscapes into the core of their structures. When she died in 2016, Hadid had the distinction of being the only woman to receive both the Pritzker Prize and the Royal Gold Medal for her inventive sense of design. From its catchy title to the clear depiction of its extraordinary subject, this book will appeal to elementary students, particularly those craving daring role models. The simple text flows as easily as Hadid’s ideas, and Winter’s painterly acrylic illustrations are its perfect complement, bringing to life a rather stern artist intent on realizing her artistic visions against all odds. 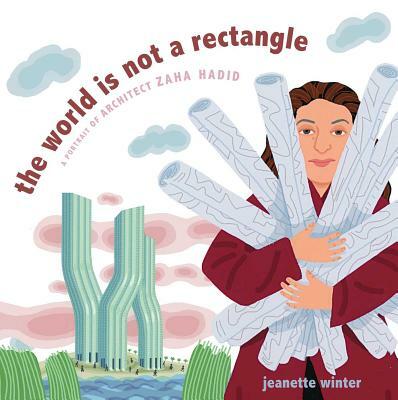 Art teachers can use the endpapers’ portrayals of Hadid’s unusual structures to help students create their own landscape-inspired designs, and mention of her Iraqi heritage could prompt discussions on global artists. VERDICT Ripe with ties to curricula, this is a great choice for art and ­biography collections. Direct quotations from Iraqi-British architect Zaha Hadid pepper this spare but engrossing biography from Winter (Nanuk the Ice Bear). After moving quickly through Hadid’s childhood, highlighting her fascination with local “rivers and marshes and dunes and ruins,” Winter devotes several pages to her remarkable designs: “tall buildings dancing like grass” (the Signature Towers of Dubai), “an opera house like the pebbles in the water” (China’s Guangzhou Opera House), and others. The undulating shapes and milky colors of Winter’s images emphasize the connections between the structures and their natural inspirations, and Hadid’s commitment to her designs features prominently: “Hadid means iron in Arabic, and Zaha is strong as iron,” writes Winter as Hadid fixes readers with a steely gaze. It’s a stirring reminder of how far nontraditional thinking and dedication to one’s ideals can take a person. inspired by those objects, whether suggesting shape, form, or color (“Zaha looks at stones in a stream and builds an opera house like the pebbles in the water”). Once again, Winter (The Librarian of Basra, rev. 1/05; Nasreen’s Secret School, rev. 11/09) opens the door for younger children to read about an innovative and strong woman who inspired others in her field and worked tirelessly to make her vision become a reality. Back matter includes a pictorial list of Hadid’s structures, sources, and a brief author’s note. Winter introduces Iraqi- born, British-educated Zaha Hadid—the first woman to be awarded architecture’s prestigious Pritzker Prize—who a century later would bring elements from nature (reed bundles, half-opened shells, waves, spiral galaxies) and drop their outsized iterations into sites throughout Asia and Europe. [The] illustrations reflect the designs of their [subject]... [and incorporate] the architect’s imagination at play alongside actual buildings come to life....also supplies a list of resources and closing author notes.